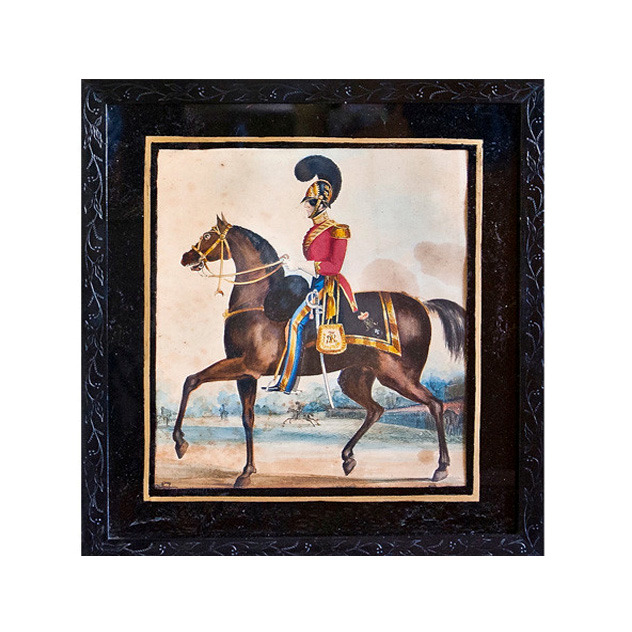 A naive watercolour of an officer of the 3rd Dragoon Guards, circa 1850, on paper, in an attractive black verre églomisé frame, with a foliate and leaf decorated border, 38.5cm x 34.5cm. A good naive watercolour of an officer of the 3rd Dragoon Guards on parade. Taking the uniform into account, I'm dating it to around 1850. It comes in a period frame with a verre églomisé mount and an attractive frame decorated with leaf motifs. It's a splendid thing. Condition: Good. There are two stains to the upper right of the paper (see photograph) and I've had the verre églomisé mount touched up in a few small places. Original period backing board. Luke Honey is a dealer in unusual decorative antiques, furniture, pictures, posters and works of art- with an enthusiasm for the "Gentleman's Library" or quirky "English Country House" look. As a former specialist at both Phillips and Bonhams, Luke has had over twenty years experience selling antique games and is considered a leading authority on old backgammon boards, antique chess sets and chess boards, gambling and racing antiques and mah jong. Luke operates from premises in Central London, where all stock can be viewed by appointment. Items can be viewed online at his regularly updated website: www.lukehoney.co.uk. Luke also hires out stock to stylists and film production companies on a regular basis. He exhibits at the Battersea Decorative Antiques & Textiles Fair twice a year. Luke is a member of the Royal Institution of Chartered Surveyors (Art and Antiques Division) and a custodian of the Frederick Parker Chair Collection. He has written numerous articles, lectured and appeared on both radio and television. In his other life, Luke is an enthusiastic amateur cook and blogger (Luke Honey Inspiration), is a regular contributor to Homes & Antiques, enjoys backgammon, piano and gin and has an unhealthy interest in second-hand books and unreliable cars.